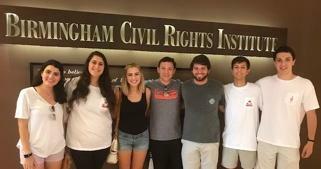 Photo is of the Hillel Connections interns at the Birmingham Civil Rights Institute. This summer a group of seven students from the University of Alabama took part in the Hillel Connections internship program. (Hillel is the Jewish student organization and receives funding from the Birmingham Jewish Federation Annual Campaign. The program, finishing up its first summer, aims to help Jewish students find internships in Birmingham, introduce these students to life as young adults in Birmingham, and help them connect to the Jewish community. They were employed in firms across our city in roles relating to their fields of study and also spent time exploring and getting to know Birmingham. The following was written by Jake Kaplan, a Hillel Connections intern. Summer 2018 was a memorable one indeed. This summer six other Jewish students and I from the University of Alabama had the opportunity to take part in the Hillel Connections internship program. We have spent the last eight weeks working in a diverse set of industries including medicine, finance, and family services. Our program has been about much more than work experience. Hillel Connections is focused in part on building relationships here in Birmingham, and accordingly we have also gotten to spend this summer getting to know the community and building one up among ourselves as we lived together in the University of Alabama at Birmingham dorms. Perhaps one of the best parts of this program has been the community aspect. Those of us not from Birmingham were each paired up with a “family-friend,” a local family that offers themselves up as a variety of resources to their student. Their hospitality — as we did laundry, ate dinner with them, and got to know them and their families — did not go unappreciated. To all those who have taken part as family friends, your generosity is only possibly matched by our thankfulness. We have been so lucky to have these families as resources, and it has been a real pleasure getting to know them as well. These family friends have been one of the most endearing parts of our program, and we all look forward to hopefully inviting you into our “home” of Tuscaloosa as the school year begins. After all, thanks to this program we have gotten to experience so much of Birmingham. When we haven’t been in our respective offices we have been getting to know Birmingham through a variety of activities. Just one example from early in the program was our tour of the Civil Rights District. The tour took us through the 16th St. Baptist Church, Kelly Ingram Park, and culminated with an excellent guided tour of the Birmingham Civil Rights Institute. While we had all been on educational tours before, it made the experience much more special getting to hear first-hand accounts from the Civil Rights Movement by community members. We, the interns, were also touched when we recognized the time, energy, and money the community here had invested in us so we could have the chance to learn that day. This summer was a lot of fun too and has us starting the school year with new friends and great memories! We spent afternoons at the pool and evenings watching the Baron’s. We ate at every delicious restaurant we could in Birmingham and did community service together. We spent Shabbat joking around the dinner table, but also discussing our individual Jewish identities and how they fit into the world and each of our lives. The goal of our program is three things: to help students find internships, to ensure these students have a good experience in Birmingham, and to build a connection between our students and the Birmingham Jewish community. As someone who has one week left in the program, I can proudly say the program’s first year was a success! I can say without any doubt that each of the Hillel Connections interns has been truly touched by our time in Birmingham. We have seen and done so much this summer, and we could not have done it without the support of our underwriters at The Birmingham Jewish Foundation and the Rabbi Grafman Endowment Fund of Temple Emanu-El. Nor could we have done it without our employers who have given us all such great opportunities. Lastly, we want to extend a thank you to each of you individually who have welcomed us into your homes; both your literal homes and the collective home of Birmingham. It has been a real pleasure getting to meet each and every person that we have, and, as we begin preparing for next year, I invite you all to get involved with our program however you can because I can say it is certainly worth it for the experience! Click for more on Hillel Connections.